Regular Joe: The Heroes We Choose - Harry Ferguson - The Greatest Irishman You've Never Heard Of. The Heroes We Choose - Harry Ferguson - The Greatest Irishman You've Never Heard Of. * Another long post with some hi-falutin theories - so maybe try this one with some biscuits and a cup of tea. I love the story of Harry Ferguson - An inventor, a truly great man, a genuine genius and also a maverick. He should be an inspiration for every Irish schoolkid, but today he is virtually forgotten. Those who know about him - and about his life & work - will rate him one of the greatest Irishmen of the 20th Century. And the story of the Tractor Wars he fought with another great Irishman - Henry Ford - and his grandson - has long fascinated me. I think the heroes we choose say a lot about us. And I wish more people knew about Harry Ferguson. · * Holding Out For A Hero – John Wayne, Tom Crean & A Short History of Tractors In Irish-American. You can tell a lot about a people by the heroes they choose – and by those they choose to forget. In the post Good Friday Agreement/Celtic Tiger era, we saw the rise of The Legend of Tom Crean, a blessedly apolitical hero for a rapidly changing country that wanted to put the firebrands and Men In Uniform behind us. Crean shot from historical footnote to cultural icon, starting with the publication of Michael Smith’s An Unsung Hero: Tom Crean Antarctic Survivor in 2002. A very successful, multi-award winning one-man play – Tom Crean – Antarctic Explorer (written and performed by Aidan Dooley) followed, as did an iconic, lavishly produced Guinness ad. And when a historical figure is co-opted by Diageo to sell stout, you know they have really arrived. Crean was and remains The Perfect Irishman, an ad-man’s dream despatched straight from central casting. Strong, silent, ready to undertake epic acts of heroism without a word of complaint. The stoic, handsome Kerryman who played a vital part in one of the most heroic tales of the 20th century and then came home to quietly run a pub, was the man most Irishmen would want to be. Young Tom ran away to sea when he was 15, leaving the family farm in Kerry, took part in three of the four major expeditions of the Heroic Age of Antarctic Exploration and was part of the legendary sea crossing to South Georgia, an almost insanely audacious mission to raise help for the stranded men of the ill-fated Shackleton expedition at the height of the First World War. The fact that he never sought fame, that he was simply content just to do his job and put his life on the line for his mates, made Crean all the more attractive. 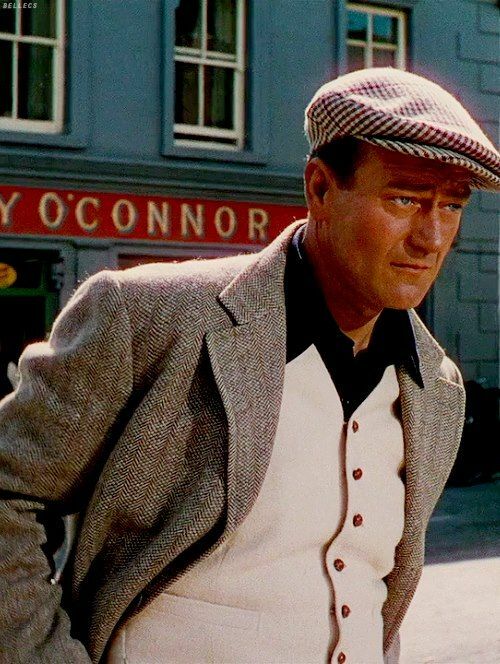 In the ‘50s, John Wayne and John Ford gave us The Quiet Man, the Yank cousin made good. Sean Thornton was a Big Fellow across the water, a sugar-coated wonderland when compared to the monochrome, repressed world of early 1950s Ireland. Sean was still recognisably Irish, still handy with his fists, a hit with the dames and fond of a drop. But the ex-boxer returned home was beholden to no bishop or bossman. An unapologetic, freeborn man of the USA. But Sean Thornton only had a brief reign. From the ‘60s onwards, as Ireland started to become more Technicolor than John Ford’s classic slice of Faith ‘n Begorrah ever was, Two-Fisted Sean Thornton became a bit of a joke. However, we would have need of a Quiet Man again. In the noughties, we started to seriously lose the run of ourselves, as Irishmen struggled with metrosexuality and dressed as if they had been covered with glue and fired through the designer racks of Brown Thomas. And Crean, the rugged Kerryman with the soft eyes who conquered the Antarctic, remerged from the shadows to remind us of who we were supposed to be. Who we wanted to be. Bertie Ahern’s weirdly suburban vision for the men and women of Ireland was of Boy Bands and Chick-lit, faking it in Range Rovers and holidaying on golf courses in Alicante, mortgaged to the hilt but still spending. But even at the height of bland, beige Bertism, most of us still had a vague notion of a real Irishman. And we recognised it in Tom Crean. It didn’t matter that he must have been a more complex man than the legend would have it. He really was a hero. And just as importantly in the new, post-Troubles Ireland, he didn’t kill anybody to become one. For the largely confused Irish male, Tom Crean represented the father or grandfather we wanted to have. The “Giant Irishman” who cuddled sled dog pups and ripped up ice-bergs with his bare-hands. However, while Crean’s uncomplicated heroism is to be admired, there is one man, great in many ways, problematic in others, of whom you really could make the argument for being the Greatest Irishman of the 20th Century. He had a global impact and a legacy that still remains strong to this day. A maverick and a genius, he revolutionised agriculture and agri-business. His inventions vastly increased crop production and helped save millions of lives in a starving, shattered Europe after the Second World War. And this man, Beflast-born Harry Ferguson, is virtually forgotten. Ask 100 members of the Irish public to tell you who Harry Ferguson was, and it’s doubtful even one could. Strangely, it’s entirely possible that there are more Ukrainians than Irish people who have heard of Harry Ferguson (as the inventor of the modern tractor, Ferguson is something of a hero to many Ukranians and even merits a long tribute in Marina Lewycka’s popular novel, A Short History of Tractors in Ukrainian as a “genius inventor” who “contributed richly to the history of mankind”). Ferguson was hot-headed, mischievous and teak-tough. He was an engineering genius, an innovator and the first Irishman to fly. Young Harry was inspired by the Wright brothers and resolved to build his own plane. After a few false starts, he finally took to the air in his own monoplane from a park just outside Belfast on December 31st, 1909. It was just a few weeks after his 25th birthday and only five years on from the historic Wright Brothers first flight. It was also very early in the history of aviation, a former Wild West showman called Samuel F Cody had made the first powered flight in Great Britain only a year before. And the American didn’t build his own plane. In his youth, he was also motorbike racing champion and a gun-runner for Ulster Loyalist paramilitaries. Ferguson had been born in the village of Dromore, 16 miles from Belfast in 1884 (Crean was born in Annascaul, Co Kerry in 1877). His family were deeply religious (members of the strict Plymouth Brethren sect), but from an early age Harry was a declared agnostic, a decision that ruined his relationship with his father. In his early years, the only matter on which father and son saw eye-to-eye on was his support for hard-line loyalism. As a teenager, Ferguson was actually on the point of emigrating to Canada, to escape Belfast and his father, when he older brother persuaded him to become an apprentice at the family bicycle shop on the Shankill Rd. The self-taught mechanic quickly became fascinated with motors and speed. Ferguson threw himself into the rapidly growing motor racing scene in Ulster, quickly earning himself the nickname “The Mad Mechanic” thanks to his reckless, take-no-prisoners style. He also got deeply involved in Ulster Loyalist politics. In 1914, Harry and his wife Maureen Watson (they had been married for just a year) took part in the landing of guns at Larne for the Ulster Volunteer Force. It was at a time when loyalist and nationalist private armies, in Belfast and Dublin, were arming themselves for the conflict most expected to come. Drama enough for ten lives. But it was when Harry Ferguson, of Dromore, Co Down, went to war with Henry Ford Jnr, of the Ford Motor Corporation, Detroit, that the Mad Mechanic really hit the world headlines. The Tractor Wars – Ferguson V Ford – was the most high-profile industrial rights court case of the 20th century, a knock-down, drag-out battle between an Ulster-Man and the Irish-American boss of the world’s biggest vehicle manufacturer. Maverick, stubborn genius against cold, corporate ruthlessness. And this $251million dollar court battle (that’s 1948 dollars) hinged on a handshake, a “gentleman’s agreement” between Ferguson and Henry Ford Snr. As well as the millions of dollars at stake, it was a fight for the right to claim an engineering breakthrough that changed farming from the Steppes of Russia to the Canadian prairies and saved millions of lives after the devastation of World War II. Ferguson With His Creation - The TE20 "Little Grey Fergie"
In 1938, Ulster-man Harry Ferguson was invited to visit Henry Ford Snr, the son of a Cork-born farmer, at Ford HQ in Dearborn, Michigan. Ferguson brought with him a tractor that he had designed and built, with a revolutionary hydraulic linkage system that represented a quantum leap forward. It was the Model T of Tractors but so much more (one of Fergusons early tractor designs had been based on a Model T and he had been in contact with the Ford Company since the 1920s). The Ulster man was – as he saw it – on a mission to change the way the world produced food. He really believed his invention, the greatest leap forward in agriculture since the invention of the plough, could feed starving millions. He said; “There must be implements of an altogether new type which will produce, for the first time in history, enough food to feed all the people of the world. And, also, produce from the land – the source from which all wealth comes – a new wealth to enrich the world”. Henry Ford recognised brilliance when he saw it. Ferguson’s creation far outclassed anything Ford or any other manufacturer could come up with. After protracted negotiations, the two men (who had more in common than they perhaps realised and a great respect for each other) came to a gentleman’s agreement. A handshake sealed the only partnership Henry Ford ever went into. Ferguson would provide the genius, Ford, the manufacturing power. 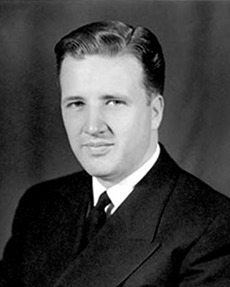 However, when Ford Snr died in 1947, his grandson Henry Ford II soon realised that his grandfather had made the worst deal of his life. And moved to end it. Harry Ferguson felt he had no option. He hired the best lawyers he could afford and went to war with Ford in the US courts. This dramatic court case would decide who could lay claim to the biggest breakthrough in agriculture of the 20th century – and the billions of dollars that would flow from this in the decades to come. Harry Ferguson was in bullish form - even as he prepared to enter a New York courtroom in 1948 to face the might of the Ford Motor Co.
"It'll be a grand fight," he told reporters on the steps of Manhattan’s Federal Court. What followed was a titanic, four-year court-room battle, Ferguson had slapped a $251 million antitrust and patent infringement suit against Ford Motor Co., its subsidiary, Dearborn Motors Corp., Henry Ford II and other Ford officials. The battle centred on the handshake agreement made between Old Henry and Harry in 1938. In the first seven years of the agreement, the Ford Company made 303,501 tractors to the Ferguson design, as well as licensing related farm implements (all to the Ferguson system) $313 million, netting Ferguson $4.3 million in 1946 alone. But the Ford company itself, said young Henry, had lost $25 million on the deal. He decided to set up his own company, Dearborn Motors Corp., to market his own tractors. Ferguson took one look at the “new” Ford tractor with its hydraulic lift, and filed suit. Ferguson also took the brave step of setting up his own plant, right on Ford’s doorstep in Detroit, to manufacture a rival tractor. In effect, there were two versions of the Ferguson tractor being made in the US, one by Ford, one by Ferguson. Alarmed by the competition, Henry Ford (Young Henry) visited Ferguson in England to try and reach a settlement. Ferguson said no. He wanted to be paid what had been agreed by Old Henry. In the first year of the suit alone, both sides spent an estimated $300,000 each on legal expenses, two armies of lawyers faced each other in Manhattan as the world’s media looked on. Ferguson won several battles but lost the war - he could not prove that Ford had stolen his ideas to monopolise the tractor business. After four years, an out of court settlement was finally reached. The cost to Ford was $9.25m - at the time the biggest patent settlement ever paid in a U.S. suit. In the settlement, Ford conceded that it had infringed Ferguson's patents by copying the hydraulic valve, coupling system, and the power-take-off setup, and agreed to make restitution to Ferguson on the basis of about $21 for each of the 441,000 tractors Dearborn Motors has made since mid-1947 (Ferguson had asked $100). Ford also agreed to alter the designs of its own tractors enough to remove any further infringement. Ferguson had proved that his designs had been the “inspiration” behind the Fordson tractor. He had been vindicated as the designer of the modern tractor which has remained largely unchanged to this day. But he had lost out on millions in future profits. His great legacy is the modern agricultural tractor and the three-point linkage system which revolutionised farming across the world and helped to feed millions of starving people after WWII. He also came up with the four-wheel drive system used to this day on everything from suburban SUVs to military vehicles. His “Little Grey Fergie” TE20 Tractor and his linkage-system could be argued to have saved as many lives as the development of penicillin and drought resistant wheat. Ferguson's avowed aim – as an inventor – was to save the world from hunger through cheap and reliable farm mechanisation. A maverick, a genius, an Ulster-man. An Irishman. So we have to ask, why no statues? (apart from one at his birthplace in Co Down). Why no best-selling biographies or million-dollar Guinness ads? Why do we celebrate Tom Crean and not Harry Ferguson? Crean was an undoubtedly remarkable man, his epic journey to South Georgia Island saved the lives of 27 men. Ferguson saved the lives of millions, his legacy lives on, not just in the Massy Ferguson tractor corporation but also on farms all over the world. But Harry Ferguson was a complicated man with a complicated story. He did not have heroism trust upon him, as Crean did (though he rose magnificently to the challenge) but shaped the world as he wanted to see it. He actually did more than that, he grabbed it by the throat. There is also the complication of his early and vociferous support for Ulster Loyalism, perhaps a big factor in him being virtually forgotten in the Republic. Even though his Little Grey Fergie is revered by tractor enthusiasts to this day. There is an iconic photograph of Crean in Antartica, holding a litter of sled dog puppies, pipe in mouth, he looks rugged yet kindly, a soft-eyed Irishman. The photos of Harry Ferguson show a serious, scientific or business looking man with wire-rimmed spectacles and a receding hairline. His gaze is myopic but steady, challenging, even. Crean – or at least The Legend Of - is cast in the great heroic tradition of Ireland. The quiet man, the rugged farmer who rose to the challenge. The hero who never failed his friends and comrades yet gladly walked off the pages of history to find a quiet life far from the city. Ferguson understood business, he instinctively understood globalisation long before the term was coined. He was from a farming background himself but looked out into the world and the new possibilities of the 20th century. He built his empire and fought those who tried to take it from him. In the 21st century, the two men represent a strange fault-line in our national psyche and our identity (especially in how Irish men see themselves). Our most successful businessmen, from international telecom entrepreneurs to budget airline bosses, still want to be seen as, at heart, one of the lads, fond of a pint and a football match. Able to mix it with peasants and kings and enjoy the company of both. Sons of the soil or thrusting entrepreneurs? Catholic or protestant, nationalist or loyalist, GAA or golf? So we choose to beatify of Tom Crean and forget Harry Ferguson. But the heroic age is long gone (and wasn’t even very heroic at the time).